Hey Kristen! I wanted to let you know that I love your post. I received a MFA in Creative Writing where we learned about log-lines in terms of screenplays and TV shows, but when it comes to writing books, I think log-lines are just as important. As a writer, when it comes to plot, do you think that it goes hand in hand with your log-line? I know the gist is to capture the reader or person interested based on the logline, but what if in the plot is where it gets interesting and does not show in the logline? What are your thoughts? Other readers/followers of this blog please chime in as well! Log-lines for novels (as I teach them) are almost a formula: Protagonist + Antagonist + Active Goal + Stakes/Ticking Clock. A combat nurse suffering PTSD (protagonist) wakes up to find the world she knows is gone and she is 500 years in the future. She must uncover (active verb) the source of the time shift (antagonist because it can be a person or a thing) before those she loves from this world and the last are erased in a singularity (ticking clock/stakes). I like the way you explain it better. Thanks so much, I use this formula in my writing. Thanks, Kristen! Loglines are more than just a selling tool — they are the conceptual nucleus of your story around which all the other particles organize. The “small details” are malleable — plot points can be shifted, characters can be tweaked — but the logline itself is sacrosanct: It’s the magnetic north that keeps your story from drifting astray in the writing process. Just remember: A good logline allows you — and others — to “see” the entire story without any of those small details that we as writers get so hung up on. If I pitch you a story about a beach-resort sheriff who finds himself in over his head when a great white shark swims into the waters off his island on the Fourth of July, you can already see the plot possibilities — and the fertility of the premise — without any further elaboration. That way, before I write a single scene or line of dialogue, I’ve already given myself a pretty compelling foundation upon which to build my story — through the logline — so all I have to do is not screw it up. That’s why honing the logline is always the first crucial step to breaking the back of a story. Hey, Love your blog and find it worthwhile. I, myself, try to be entertaining while teaching how to write and motivation and lots of good discourse on the subject of writing. I also review submitted materials FREE. Full disclosure: The web site listed is mainly for writers; however, it is chock full of good information and knowledge for procrastinators, bloggers, web site creation information, etc. Here is another great blog to follow if you have not already! This particular blog focuses on plot and log-lines. I made a post about writing the plot, but Kristen goes into more detail. Writers please check this out and re-blog! Kristen speaks the truth about writing. I love this blog so much. Check to her books as well on amazon.com and in stores! Best explanation of character wounds I’ve ever read! I like the question about the garage! Your article concerning plot, characters, etc,. is a good one. Looking at my novels (unpublished) I see that in some circumstances there is not enough conflict, not enough wounds. I feel like you do concerning the fact that a small wound can really be a sore spot. Think about a hang-nail? Ever try to push one past a silk pillow when you turn over at night? Won’t work! I’ll try harder to have sore spots. This was a fabulous read. No need to enter my name into a hat since I do not have a novel or query letter for you to peruse. I just wanted to let you know I appreciated the words here and am cataloging them for future reference when I DO begin my writing. Anakin was utterly unlikable and unredeemable simply because the writers were more focused on how many characters they could make into McDonald’s Happy Meal toys..
Never heard this put better. Focus no the storytelling. Terrific essay. You’ve given me a great deal to think about. Yes, I totally believe writing can be both healing and therapeutic, and I have used my own wounds to create both characters and plots. When I wrote my first novel, which underwent more total revisions and edits than I can count because I made every beginner mistake you can make, I knew one basic thing, i.e. write about what you know. Therefore, I wrote about an abused wife who packs up her kids in the middle of the day and moves 1500 miles away to get away from her homicidal husband. That was the wound and the beginning of the plot, and the truth that I had experienced. A lot of fiction was added to it like her finding her forever love in the form of an ex-preacher rancher and her ex chasing her halfway across the country and kidnapping his children to exact revenge upon her, which ultimately resulted in his demise. However, writing it was quite cathartic especially the flashbacks of some of the more violent fight scenes between the heroine and her then husband. I actually relived those bloody awful fights as I wrote my way through them, and I came out on the other side healed and whole, and more determined than ever that no on would every physically abuse me again. And, they haven’t. Now, the emotional abuse, well that is another story for another day and another novel. The novel sold, eventually, to a so-called traditional publisher, and that is also another story for another day. Hello Kristen! Long time reader, first time commenter here. I just wanted to let you know your blog has helped me immesurably. I was never formally trained in writing (quite the opposite; I opted out of English/Literature classes as soon as I could), and as such never even heard of log lines or deep POV. It’s amazing to know that there are great people like you here to help. Thanks! Thanks so much for sharing, not just for the tips but for the real-life examples. We hear all about plot and character, but not much about the wound. Great; now to work on this! My mother is a musical prodigy and was disappointed that I wasn’t. I could learn to play an instrument by following notes on a page, but I couldn’t hear a song on the radio and produce it perfectly on the (instrument of choice) like my mom has been able to do since she was three. I pulled from that experience in one of my novels. I plunked my non-talented protag (whose mother is a musical prodigy) and placed her in an arts district, surrounded by artists and musicians. Then I have her chase after the acceptance of those she wants to be just like but isn’t. excellent post. Yes, My NIP includes some real-life experiences of being betrayed by a husband. And as an ex-psychologist I’ve studied several books about psychological wounds that haunt our actions in the here and now and am now using that to develop my protagonist. It’s amazing how having a grounding in what the character wants at the deepest core can influence and enhance how you write her. Really enjoyed this blog entry. I’ve been thinking about these issues–the sense of deficit in feeling cared for, safe, or recognized as an individual–in relation to my writing but hadn’t characterized the crux as a wound. It’s the perfect way to look at what drives story. Thanks for posting your thoughts! Well, Kristen, your post certainly a page turner! You walked your talk and I loved every word of it. I write a memoir but your tips are as relevant to me as a fiction writer. Loved it, thanks for sharing your skill and wisdom. Your tips are gold! Another great post to apply to my writing. You’re the best teacher out there. Kristen, thank you so much for taking the time to write down this excellent advice. It is a good refresher for me, plus I often pass along the address for your blog to novice writers. Wonderful post as ever, Kristen, thanks. Semi-off-topic question: do you have any plans to teach another blogging/writer bio class in the future? Your book is a master class in itself, but being in a live class with the Q&A is wonderful too. Yes, I do. I am planning on teaching a lot more toward the end of August and into fall/winter. Summers are slow. I’m relatively new to WordPress and came across your blog. Wow! I’m hooked! I just bought your book and am floored by the great information you present. To any people out there who read this comment , Kristen’s book is worth purchasing if you want to build your platform! It made me want to scrap my existing blog and start over…… Thank you for pointing me in the right direction before I spent too much time swirling in a cesspool of my mistakes! You are awesome! Awww, thanks! Great to meet you! I am really happy my book is helping you 😀 . I don’t gush about a lot of things, but this lady is AWESOME! I admit that I’m a convert to Kristin Lamb’s blogging philosophy and strongly recommend visiting her site and buying her book if you’re serious about creating your marketing platform. It’s because of her book that I will be shutting down this site and recreating a “true” author’s blog under my own name. I just need to complete some of the exercises she recommends in her book. This has me thinking about my plot and the characters and any wounds they have they help drive the plot. It is a fantasy and the death of a loved one is what drives my antagonist, several loved ones. It is this fact, that so many he loved have died that he doesn’t know how to love anyone else. I know this is a big wound, so maybe I need to focus on smaller everyday wounds that can drive him as well. This sounds like a simple Bildungsroman, but I like how you explained it in detail. This will probably help me to know what to do next in the story that I’m writing now. Thanks for sharing your knowledge. Thanks for this post. It helped me to “dig a little deeper”when thinking about conflict. Thanks for such a good post, Kristin. I always learn so much. I’m rather late to writing (72), and still have my main characters much too reasonable and 2-dimensional. Sigh. I’m working hard on the edits/revisions I’m making to up the ante on them in their life challenges and wounds. Getting there slowly. Another inspiring and insightful post, Kristen! I have been struggling with exactly this issue in my current story. I have a sense of my main character’s wound, but haven’t forced myself to stare into its grittier parts or decide how it will change and resolve throughout the plot. Basically, I’ve been hoping it would clarify itself as I made my way through the rough draft, but I see now that I’ve mostly been lax about my character development. Thanks for forcing me to face my laziness! I’m sure my story will benefit from yet another lesson learned, courtesy of your excellent blog! Stumbled upon your great blog yesterday while searching for “writers with ADD”. I read that post and now this one. I LOVE what you’re saying and HOW you say it so much that I just ordered “Rise of the Machines” from Amazon. I was going to order “We Are Not Alone” but I was amazed to see that Amazon wanted so much money for it! Maybe next time. Meanwhile keep on doing what you’re doing – it’s AWESOME. Wonderful! 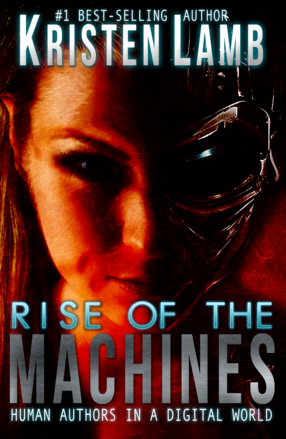 Actually, that book was pulled because the content was out of date (which is why I wrote Rise of the Machines to have an enduring shelf life). I am actually writing a NEW “We Are Not Alone” but thank you for your purchase and it is fantastic to meet you! See what a NICE person you are? A lesser writer would have harangued me for not buying ALL of their books, but not you! I will wait (semi-patiently) for the NEW “We Are Not Alone.” Thanks so much. I appreciate the insight. I struggle mightily with coming up with a concise description of what my book is about. I would like to attend Your Story in a Sentence workshop but date doesn’t work for me. Can I get on a list to be notified of the next one? I will offer it again. The session is recorded even if you have to miss and I would get your log-line repaired even if it is not in class 😉 . We can figure it out 😀 . To begin with, I probably should not have read all the comments re: your blog post as I don’t believe there is much more that can be said that has not already been said multiple times. I will say, which has also already been said herein, your blog does the best job that I’ve seen to date on addressing all the prerequisites pieces to writing a novel, and for this reason I am going to reblog your post, something I rarely do. My problem lies not in fitting the necessary elements into my novel. My problem lies in figuring out how to cover my six when writing a non-fiction novel about the government/military. Eh, good luck with that. We are in scary times. I am not so brave. Thanks for the compliment! Great to meet you! Great to meet you as well, Kristen. I am currently traveling but would like to reblog your blog post once I can sit down and write an intro. I am an English major, but I know there are new writers that give up because they do not have the background and become easily confused. Your blog will help these struggling writers, or so I believe, as your blog post is succinct in laying it out, which I believe will remove the confusion of beginning writers. Of course, I would be remiss if I failed to mention your wit that accompanies the required elements in writing a good novel. A great read but allow me to offer a counterpoint only because I just read an author who’s entire cast of protagonists were wallowing blobs of self-misery. “The wound” is an inspiration, a spark, a motivation for a well-rounded character; be careful defining them solely by their woes or its just depressing. That was the mistake the producers of How to Get Away with Murder made with Viola Davis’ character (and, to some extent, that’s what is weighing down this season of True Detective). A psychic wound — or “fatal flaw,” as it’s sometimes known — is just one of five traits that comprise a fictional character; no one characteristic should be more important than the other. I think great stories are about what happens when people have great odds and are determined to beat them. But I’m a fan of reality. Which means I like reading about when they win. I like reading about when they lose. I like reading about when there’s a 50/50 split. Of course, sure, I’d love to have a life in which I always won. That hasn’t happened yet. The prognosis for tomorrow isn’t good (not for perfection, anyway. . . hey, I’m going to an orthopedist for my back). Different people have different reasons for reading, yes? There are some great books out there that are about characters who did not win and I mean they did not win big time. We Need to Talk About Kevin, House of Sand and Fog, and Olive Kitteridge come to mind. Not to mention something like half of Shakespeare’s plays. Ultimately, I just don’t think you need the “overcoming” to have the great story. Hope I win the critique of my first 20 pages. . . I’m willing to overcome the odds this time!!! But if you look at a lot of those stories, they still have a win and often it is subtle and in the character arc. Actually good endings should have a win-lose, but that is another post 😀 . The point is that if we put a protagonist into a plot where he/she can easily win? Eh, snoozeville. We have to make the fight/struggle worth our reader’s time. You mention making a script agent ready. I’m just wondering if you have written an article on how to snag an agent. Having heard stories, it seems to me that agents are just as fussy about who to take on as publishers are about who to take on. I am just beginning to write a new story and this post will be very helpful to me, thank you. I would actually love to watch a short fan film of a mock-indie of Luke Skywalker and his dull life in Tatooine. With characters, there needs to be room to grow in a story and I think the wound opens up the ground for the seeds of plot to begin. Love this post!! Many helpful ideas! Well said! I love the bicycle chain analogy. This helped drop one last missing peice in for my next book. The character’s attitude about the wound and her self image needs to stand out. Click. I’m constantly forgetting this bit about returning to my protagonist’s wound–I’m glad I ran across this tip this morning! But linking to me will get YOU hits and will give you favor with search engines 😉 . A must read for Writers. I really enjoyed this! Great article! No matter how many books we write, it’s good to go back and review these concepts and be sure we are making our story strong and effective. Thanks for the reminder, Kristen! Thanks to Lynettedavis I have found this blog. A real eye opener with a lot of good tips to improve ones writing. I have only written a couple of health books before I wrote my memoir “We Don’t Talk About That” and I think, despite having had very good reviews I may have been able to improve on it. Working on the sequel I will include some of your tips and I know I’ll come back and read more or your excellent blogs. Thank you for taking the time to help so many of us. I had to share this blog on my own site. Not just for the chance to look temporarily brilliant but also to remind me about what matters…really matters…in a story. Make the reader CARE if your character survives. Whether you are a seasoned, an intermediate, or a new writer that has just started getting your feet wet and you do not know Author Kristen Lamb; you must get to know her, and she has a great blog you can follow in order to become acquainted: (https://warriorwriters.wordpress.com). Kristen Lamb is the #1 best-selling author of We Are Not Alone—The Writer’s Guide to Social Media and Are You There, Blog? It’s Me,Writer. Kristen is quite witty. If you’re anything like me, you tend to tune in and retain more from those who are witty knows what they are talking about. Let’s face it, the writing industry is confusing, and especially if you do not have a background in English, Journalism, or Communication. If you are reading about your craft, and hopefully you are, as well as reading other writer’s books, blogs, etc., the terminology, method of putting a story/novel together can be overwhelming. Writing a novel is much like putting a puzzle together. Sounds easy, doesn’t it? Well, let me tell you, it is not. Like pieces of a puzzle, there are pieces of a novel and if you fail to put the pieces in their right order, your novel will not work. You may be scratching your head, rolling your eyes and thinking what I’m writing is psychobabble fluff, but I promise you it’s not. Let’s talk about some of the confusing write-speak just briefly. When it comes to writing, if you are any kind of writer, you get plot easily enough, hopefully. But what do you know about log-lines? The characters sound easy enough, but there are many elements to your characters too. The emotional connections, and the distinct wounds, and how do you tie these problems and dramatic events to your characters? What about generating story tension and timing the introduction with your characters and their problems/wounds? There are many pieces, but the timing for introducing these pieces is critical to GOOD writing. I am traveling; the truth is I am camping and I am without the luxury of my 24 hour Wi-Fi, so I am remiss in re-blogging Kristen’s excellent blog post, Generating Page-Turning Momentum—Characters & The Wound. Unfortunately, there was a give-a-way that accompanied this blog post that expired on July 31st, 2015. Personally, I believe the blog itself is a give-a-way. Kristen’s blog lays it ALL out better and more concisely than I’ve yet to see it. It was a great refresher for me. Anyway—read, giggle and take notes. I guarantee Kristen’s blog will allay some of the confusion that writer’s encounter. Thank you for sharing! This info is extremely helpful for a newbie like myself!